Bhutan Dhenzang Travel is one of the leading tour operators in Bhutan, offering personalized tailor-made journeys through out Bhutan. It was established by Mr.Karma Letho in the 1990’s. 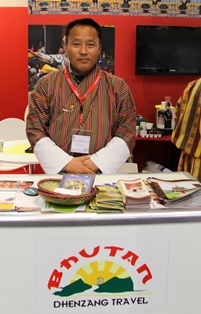 Bhutan Dhenzang Travel & Tours has grown to become a name synonymous with quality and excellence. Our team of professionals has been handpicked from diverse backgrounds to include people with a shared passion for travel. We have travelled extensively throughout Bhutan and know our places/destinations intimately. Our deep and personal knowledge of Bhutanese cultures, history and ways of thinking, enables us to give an immediate, considered and honest response to almost all queries from prospective clients. We are committed to quality, passionate about our destinations, value our clients very highly, and offer reasonable prices. This simple work ethic has given us a vast pool of satisfied clients as well as a sound financial base. We are proud to generate well over half of our customer from repeated clients and referrals, whilst enjoying a client’s satisfactions level higher than 98%. We take pride in what we do and endeavour to provide the highest levels of services and excellence for our guests. In our view Bhutan Dhenzang Travel & Tour is the choice of the discerning traveler and we strive to be your caring travel companion in your journey to Bhutan the Land of the Thunder Dragon.